The Story of Bob Marley | Inspire One. He was born in the village of Nine Mile, in Saint Ann Parish, Jamaica In 1945 His mum was 18years old when a white Marine officer aged 55years impregnated her and left her in poverty with little Marley in a small slum house. Due to poverty she took Marley to his Matrimonial grandfather. They had no money to take Marley to school so Marley hustled and became a bicycle welder to make ends meet but satan could push away the ends anytime they almost met. When Bob Met The Wailers, he fell in love with music and was determined to make it. Atfirst Producers ate all the Wailers money so Bob’s poverty couldnt end even with music. One day he went to his rich white family to ask for a living place and money tohelp his music but they chased him awayand immediately he sang, “THE STONETHAT THE BUILDER REFUSED, SHALL BE THECORNER STONE, THE THINGS PEOPLE REFUSE ARETHE THINGS THEY SHOULD USE.” Bob never gaveup and in 1970, Bob had changedhis management and he conquered the world of music better than the Wailers who left him. 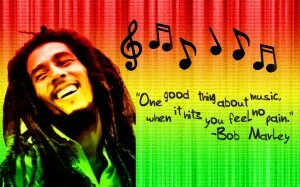 Today, Bob isarguably the father of Reggae because he brought it to theworld. He is the 1st internationalsu perstar from 3rd World. Ironically, Bob became more famous and richer than his white relatives who rejected him. Bob was so rich that when asked by journalists how rich he was, hereplied wisely, “Having Money isn’tbeing rich, but having life is richness”. Bob is the 6th richest Legend today earning around,3,600,00 0,000 dollars per year with the music he made and his family gets the money. The money he got, he used to donate to poor people in Kingston. Imagine an artiste organising a free concert then he pays the fans. Bob was not educated in anyschool buthe said that he’d ratherget inspiration than education. Indeed inspiration is greater than just being educated. Now for you, you might be the stone that the builder/ richness refused, you might have done odd jobs to make ends meet, you might have met greedy producers, your friends might have left you. But when you stay focused with an aim to eliminate your poverty in the name of God, you shall make it and your next generations wont surfer like you. Remember, poverty ain’t the end, the end is the destination of your hard work.